These secret-ingredient Cheesecake Swirl Brownies are THE fudgiest, most dense, and chocolatey brownies that will ever meet your face... oh, and they're gluten free, sugar free, high fiber, and high protein too! 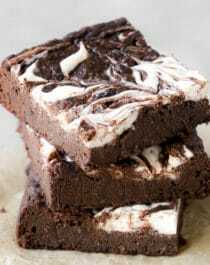 Preheat your oven to 350 degrees Fahrenheit and line an 8x8” brownie pan with parchment paper. I was a bit intrigued when I saw blueberries in the recipe. Now, I think they couldn’t be more perfect! I can imagine them adding the most perfect texture, moisture, and sweetness to the brownies! I also love the cheesecake swirl on top. Looks so pretty! These brownies look delicious! Love the use of whole foods like black beans and blueberries for both moisture and (of course) a good dose of nutrients. I want to make these but I don’t have sorghum flour…is there another flour I could substitute? Thanks, and keep up the healthy, creative recipe writing! I would really like to try your brownies. They look & sound so good but do the black beans not cause any problems with gas? Is there something else I could substitute for black beans? Erythritol in Lilly’s chocolate causes me gas also but I could probably just increase the stevia. 20 minutes probably isn’t enough time for these to bake completely through. I’d shoot for 25-30 minutes… it could also be affected by the silicone pan, as I’m sure a dark metal pan maintains heat differently. As I said before YOUR THE BEST! Trying again next week. Thank you for the support and guidance! I will let you know the results! These look really good! Just out of curiosity I was wondering what the blueberries add to the brownies? I’ve never seen a bean-based brownie recipe call for them!